The Tree Frogs were particularly melodious last night here at the homestead. You can listen here to get an idea of last night's dinner music. There are tons of things to do in the Adirondacks this time of year. The Lake Placid Horse Show begins today and the weather is beautiful for opening day. The Village of Lake Placid is bustling with athletes, visitors and campers. Can Am Hockey Camps and Summer Figure Skating Camps provide a staple stream of activity. Add the Horse Show attendees, hikers, bikers, campers, paddlers, and all those people in cars from New Jersey, and you get quite a bit of bustle. 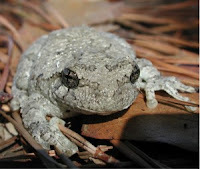 That's one of the reasons it is so nice to live a little bit outside of town; less bustle and more tree frog serenades.